This is a reflection written by Esther Kaufman on the lecture given by Dr. Nicole des Bouvrie on the 30th of November 2016. 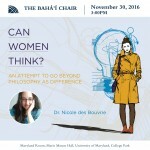 Upcoming Event Preview: Can Women Think? Dr. Nicole des Bouvrie, Visiting Scholar, The Bahá’í Chair for World Peace, University of Maryland, College Park. November 30th 2016, Maryland Room, Marie Mount Hall, University of Maryland, College Park. Please be welcome to also visit the website of the of the Bahá’í Chair for World Peace at the University of Maryland.